The headquarters of the National Bank of Kuwait was engulfed by a huge fire today, sending 2,500 workers fleeing from the flames. 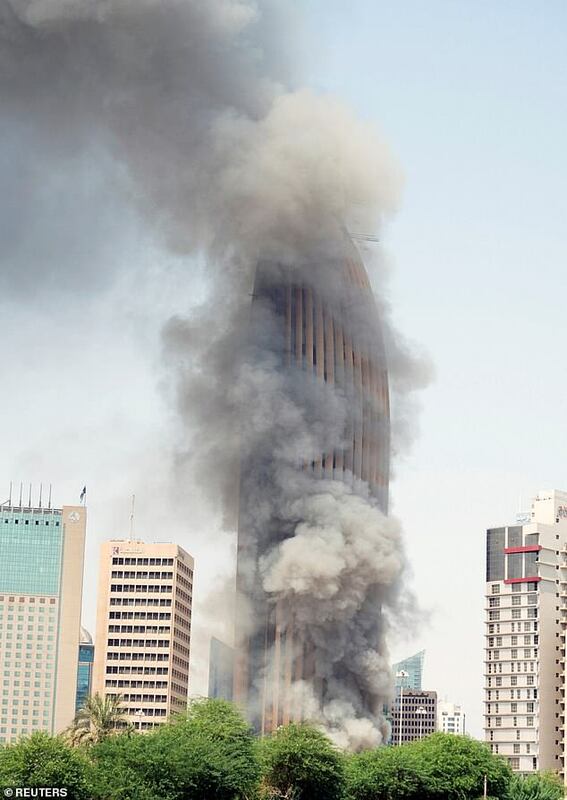 The blaze broke out in the bank's new skyscraper in Kuwait City at 11am local time, causing thick black smoke to pour into the sky. The bank said there were no injuries but the Kuwait Fire Service Directorate said six construction workers and one fireman were treated at the scene with minor burns. It is not clear what caused the blaze which had been largely put out within hours. The bank on Twitter described the blaze as a 'partial fire' and said firefighters had extinguished 90 percent of it by 4pm local time (1pm UK time). 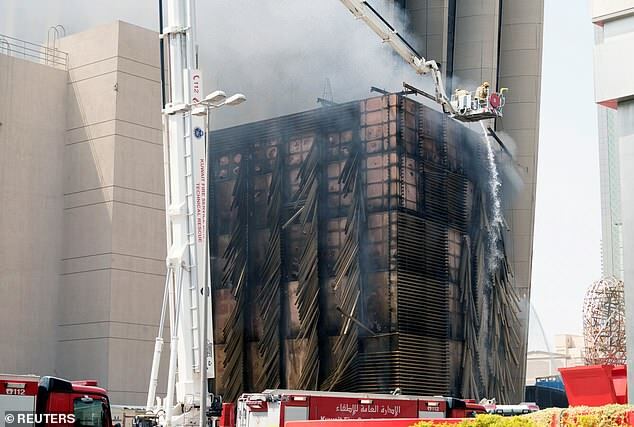 'NBK Management would like to thank the Kuwait Fire Department, the Ministry of Interior, the Emergency Medical Services for their quick response in extinguishing the fire at the new NBK Headquarter construction site and to the public on their concern for the safety of all,' the bank said in a tweet. 'More than 2,500 workers were evacuated from the site in record time without any injuries,' it added.The 62-storey tower, which is still under construction, will be some 980ft tall on completion. 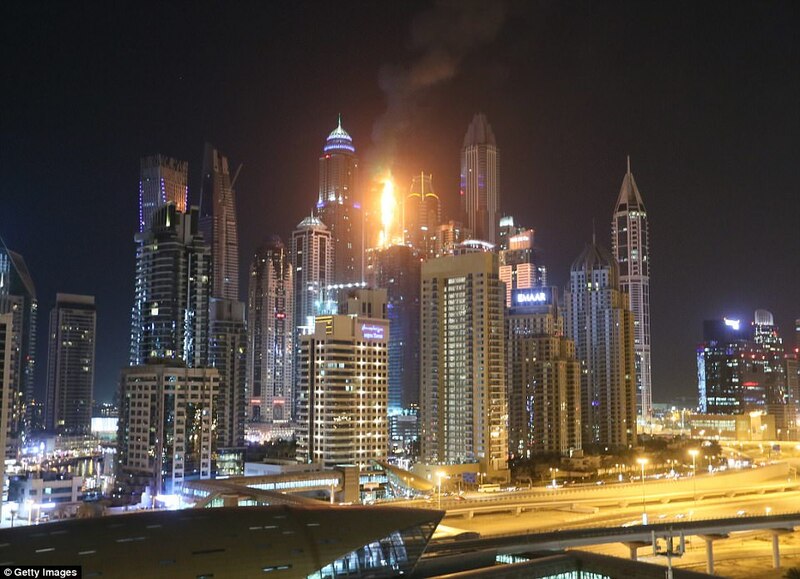 Last year, Dubai's Torch Tower went up in flames as a fire which started on the 63rd floor spread across 40 storeys. Terrified residents - including dozens of Britons - were evacuated without any injuries after a day when temperatures in the city climbed to 45C (113F). Burning debris could be seen crashing down to the ground below as tearful residents fled and firefighters desperately tackled the blaze. The same skyscraper was devastated by fire in 2015 and the building's flammable cladding, which was similar to that used in Grenfell Tower, was blamed for fuelling the flames.